@Tetnobic I guess it is because of the name. Can you change any one sensor name on MC GUI? @Tetnobic This ticket resolved. You can check this on our latest SNAPSHOT version. @Tetnobic Changed this feature bit different. 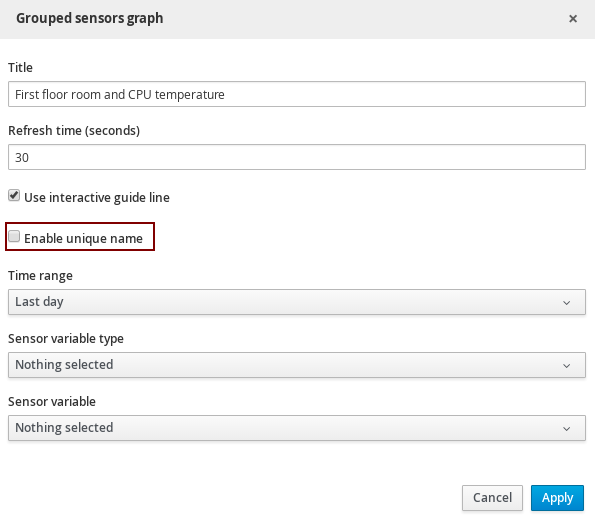 You have to enable Enable unique name checkbox to get unique chart name. @Tetnobic Thanks to reporting this issue. This is fixed and pushed changes on SNAPSHOT version. Kindly clear your cache and test with latest SNAPSHOT version. @jkandasa I test the latest SNAPSHOT and it works like a charm !! !